WARNING! Uninstall app before update! Email me if app won’t work after update. Finally fixed ICS terminal emulator bugs. Added INTERNET permission for sockets support without root rights. Font size is configurable now. Programs can be runned with root rights. WARNING! Uninstall app before update! I'd like to suggest CppCode. 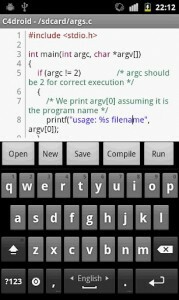 It's the first and the only offline C/C++ IDE & Compiler on iOS! No jailbreak required, no internet connection required, no ads, free(mium) app.